Leaders of an anti-rail group say they have collected enough signatures for a petition initiative that could stop the city’s proposed $4 billion rail transit system. 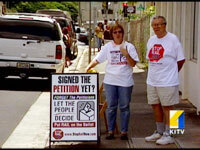 With the deadline approaching, opponents say they have more than enough signatures to place the issue on the ballot. They planned to submit it to the City Clerk's Office by 2 p.m. today. Cliff Slater, an organizer of Stop Rail Now, said they had collected about 49,000 signatures as of yesterday, when they made their final rally for signatures outside the organization's South Street headquarters. "Our goal has been 45,000 signatures, and we have exceeded our goal," Slater said. However, there is a dispute over whether their petition is valid to place a question on the November ballot. The City Clerk's Office maintains that the group called for a special election and that it failed to meet a deadline for the general election ballot. Slater said the group will take up the issue in court if the City Clerk's Office disputes their stance that they needed 30,000 signatures for the November ballot. The extra signatures are considered a cushion in case some are ruled invalid. Meanwhile the City Council is considering several proposals for a charter amendment on the November ballot. While the councilmembers agree that voters should be allowed a voice on the issue in November, they have not agreed on the language of the question. At least six of the nine councilmembers need to approve a measure.